It’s time for an Easter party! Egg hunt or a birthday I do hope you’ll love these party supplies. I still remember my first Easter egg hunt. It was amazing! It was held at my parents friend’s house and there was a lot of children. Everything was beautifully decorated and I still remember the pink and blue bunting welcoming us to start the hunt. Well the hunt probably wasn’t well planned as we were supposed to find a treat bag with our name on it and half of the kids were just too excited when they found a bag they didn’t care which name was on it (which is totally understandable) and I remember how confused I was when I got a treat with someone else’s name on it and I was told it was mine anyway :). Searching for the treats was awesome! 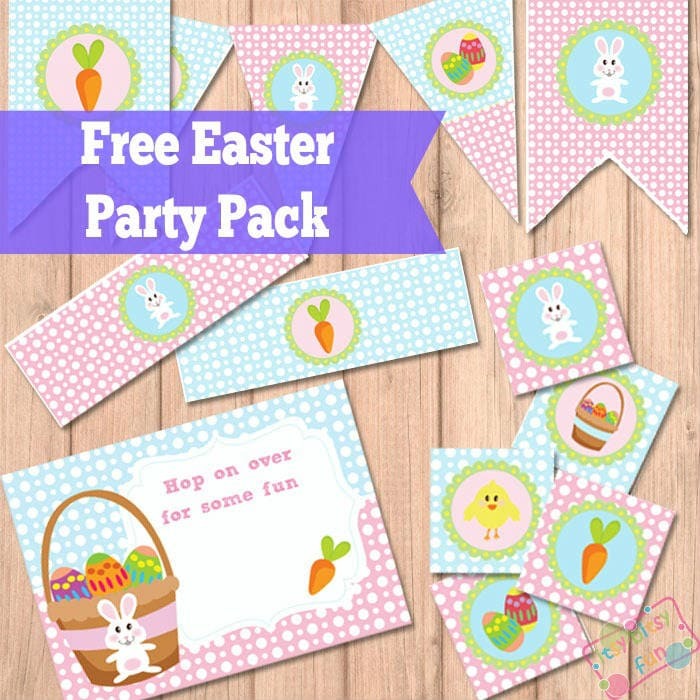 So I’ve got these free printable party supplies to share with you! You’ll find a cute invite (just write in all the details for your party), party squares (which you can cut like circles), bottle labels and two different kinds of banners.